The New York (NY) Lottery otherwise called the New York Lotto is a long-standing, official United States’ government lottery which has been going on since 1967. It is a consistent game which provides revenue for public education and can be played from anywhere in the world by any player above 18. On the other side, it is taxable and currently going through a down time as players mostly favour bigger win games. 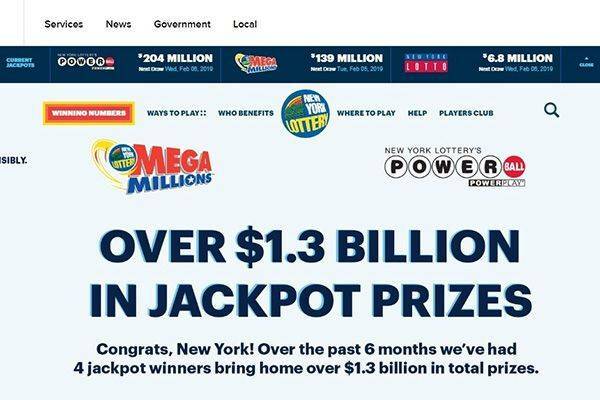 The New York Lottery isn’t known for any big wins as these are few and far between but it builds up winnings and is committed to funding public school education in New York. It is simple to play with live draws twice weekly on Wednesday and Saturdays at 11:21 pm EST and with the winning numbers published afterwards. Players are to choose six numbers from the range of 1 to 59 with a bonus ball option which counts for the second tier of prizes. There are 4 jackpot games of Mega Millions, Powerball, Lotto and Cash4Life; 5 Daily Games of Take 5, Numbers, Win 4, Quick Draw and Pick 10; Instant Scratch-off Games from $1 to over $10 and Video games. 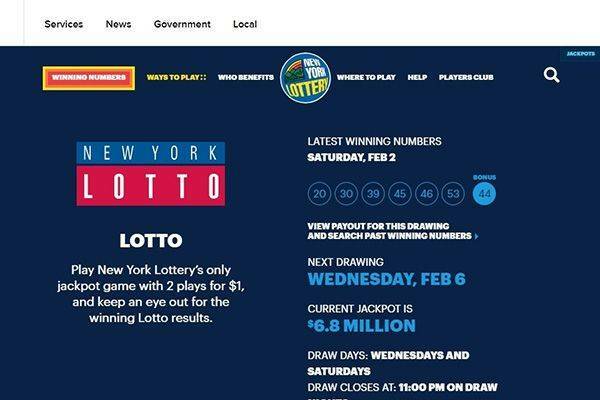 The New York Lottery is accessible on mobile and also has an app available on the Google Play Store and the Apple App Store. It displays official winning numbers and jackpot notifications once the player hits a dream amount. The app offers the option to customize your options and choose your favourite games. With this, it displays winning numbers in the game as well as jackpots and where retailers are located. The app also updates its users on new promotions and chances to win. Important features of the app include Quick Draw shows, prize charts and winning numbers for draw games, instructions on how to play games, fun random number generators, access to the Players club and NY Lottery 3D Apps. 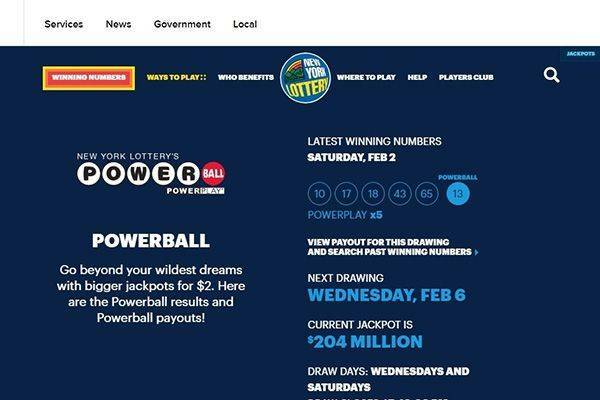 The New York Lottery currently offers two main promotions. The first promotion is for every day in February for the Cash4Life games where players can buy 3 Cash4Life ($6) up to $60 and get 1 Cash4Life ($2) Quick Pick free. The other is the 50% Quick Draw bonus on Thursdays at 5 to 7 pm. You can buy $10 or more of a Quick Draw on one ticket in February and get a 50% bonus on all your winnings on the ticket. Players who win big jackpots can decide within 60 days if they want it as a lump sum or they have the option of opting for a 25-year annuity. The games are subjected to both state and federal taxes. Withdrawals can be made of prizes up to and including $600 at any of the designated retailers up to a year after the win. They can also be claimed via mail. Official prizes are easy to claim. 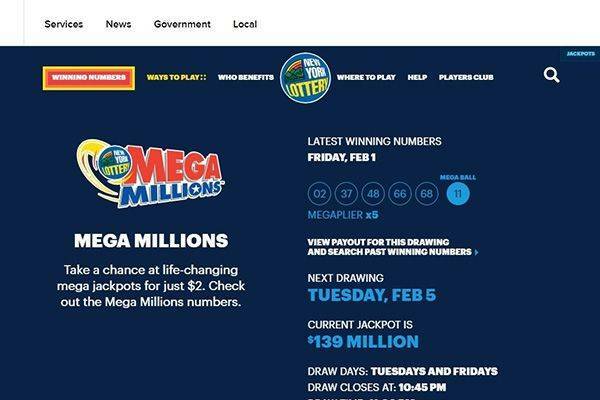 New York State Lottery has a help page as the first assist to players who need some information or experience any difficulties with the site or service – explanation on how to claim prizes, buy tickets, check winnings, etc. Chat is a feature that is sorely missing as considered a necessity to online players. IS NEW YORK (NY) LOTTERY LEGIT? As an official state lottery, the site is legitimate although no other accreditations are given. There have been complaints by lottery players about scams in which the game is used for identity theft in supposedly for processing fees. There are also scams involving getting a check for the lottery and using it as a means to siphon money. It is easy to navigate once the player is cautious and makes efforts to confirm their winnings. We would recommend the New York Lottery for small games, nothing big – a 2.5 of 5. The New York State Lottery is an official lottery of the government although it can be played from anywhere in the world. Although the winnings are little compared to others, they offer the option to build winnings and are committed to contributing to public education. Only a percentage of winnings go to actual prizes while the rest goes to taxes and the funds.